Perhaps one of the biggest transformations taking place in the digital age are the ways in which we work and conduct business. The rapid adoption of technology, coupled with a new mindset of a younger, tech-savvy generation of workers, are having lasting impacts on workplace practices. So, how do we adapt and prepare for the ever-expanding digital workplace? The adoption of new technology often starts at home and in our personal lives. Amazon claims to have sold 100 million dots by January of 2019 and there are even more mobile devices that have Siri or Google Assistant pre-installed. Using natural voice as a digital interface instead of a keyboard and mouse is becoming a viable alternative in the workplace. This doesn’t just apply to translating voice to text. A growing number of applications now have voice commands for interfacing with other applications. Likewise, a number of these solutions have already emerged in the business world including voice interaction for scheduling and starting meetings, managing communications preferences, checking voicemail, and the list only continues to grow. Hands-free interfaces are an advantage for frontline and mobile workers who need to stay focused on the customers they serve and don’t typically have a keyboard and mouse within reach. Another major workforce trend that was initially born as a consumer application is team collaboration. Gaming applications like Fortnite and Apex Legends were built on the concept of team-based environments in a digital space. Teams can communicate either through messaging or live audio and share everything from health points, weapons to ammo and information. Translate this to the work environment and now you know why team collaboration tools like Slack and Microsoft Teams are gaining traction as workplace hubs. Tight integration with unified communications solutions make these tools even better alternatives to email and other traditional methods. These advanced integrations enable multiple forms of communication, persistent conversations and information sharing within specific groups and project teams like never before. The new era of team collaboration will require careful examination of security policies and accessibility; however the benefits are undeniable. These emerging capabilities make it easier for employees to interact and communicate based on preference, increase productivity and create higher levels of engagement among teams, regardless of where they are working from. We can expect to see this trend of consumer preferences continue to drive the adoption of new technologies in the workplace. It will be exciting to see the evolution of work styles and the many advancements sure to come. Let’s start with the basics. The cloud offers easy access to the benefits of technology without having to worry about the usual challenges such as deploying, building, investing, maintaining and operating the infrastructure involved. This ease of access allows enterprises to focus on what technology can do for them, rather than how to deliver it to their users. Beyond that, we have seen time and time again that disruptive technology grows exponentially; therefore, investing in hardware will most likely result in riding out antiquated/outdated solutions to ensure you got your “money’s worth” unless you’re one of the techies who is always willing to pay for the latest and greatest (hello iPhone Max XS). The thing most buyers miss when they look strictly at the economics of moving to cloud services are the huge advantages companies have when they move to the cloud. Cloud communication tools provide a substantial advantage by putting companies at the forefront of customer relationships and generating new revenue streams. Contact center as a service (CCaaS), for example, enables enterprises to communicate via their preferred methods (chat, email, voice, text, video conferencing, social media) in a seamless interface between their employees and customers. Even businesses who do not have a formal contact center/customer service environment still need communication management tools such as mobile client support and call routing based on device or time of day, along with automated reporting to optimize performance. These tools more effectively enable distributed enterprises with remote offices, employees and nomadic users like sales. The days of putting a phone on every employee’s desk are fading fast as mobile clients and SaaS-based solutions become more accessible and user friendly. As enterprises start to follow consumers from wireline to wireless communications services, they can leverage the cloud for greater functionality and a lower-cost model. As you plot your course to the cloud or add more services, the arms race between the telco and cable providers is still escalating and a whole host of other adjacent technology vendors are now entering the space, including Amazon and Microsoft, to offer team collaboration and communications tools. That said, businesses should be wary of jumping on the bandwagon of hype surrounding some of these mainstream applications until they understand the big picture. It’s not just about picking the best software solution for unified communication as a service (UCaaS), it is important to find an experienced provider that will be your partner—not a vendor—and one that can help you find the path to the cloud that is right for your business today, while planning ahead for tomorrow. Lastly, look for a provider that also offers software-defined WAN (SD-WAN) to optimize your connections to the cloud and maximize the value of your investments in new communication technology. Predicting the future can be clouded with hype versus substance in volatile markets, but the path for UCaaS in 2019 is already becoming clear. Several strong trends are emerging that are setting the course for development and purchasing. Here are a few that you can expect to see more of in 2019. The digital workplace is driving more employee and customer engagement opportunities. Enterprises are begging to take some of these existing capabilities like chat, messaging and audio/video conferencing and couple them with workstream collaboration tools like Slack, Asana and monday.com. This allows internal teams as well as outside parties such as customers and partners to not only communicate but share documents, manage projects and engage in a persistent conversation that even a newbie can join in on and see the relevant history. There was a time when only nerdy developer types were using workstream collaboration tools but that is changing with the influx of millennials and promotion of these tools by Microsoft and others. In case you haven’t notice them heads down on their smartphones in meetings, millennials aren’t just bringing their own devices to work, they are bringing their own apps. Business leaders can either choose to lock down their applications and try to prohibit use of these apps or embrace them and determine how to maintain security while enabling integration. For Trekkies fans, the phrase “resistance is futile” comes to mind. The opportunity for companies to enable employees, customers and partners to engage with each other, documents, project plans, and even with machines is rapidly increasing. Finally, don’t think for a minute that with the new engagement tools that are expanding faster than we can keep up, hello Apple watch, that companies won’t figure out that tracking productivity for employees and customer engagement is not only possible but extremely valuable. Software that tracks, trends and predicts performance and interactions will become invaluable for insights on the level of engagement, cultural transformation and predictors of future actions. The tech evolution certainly shows no signs of slowing down and UCaaS is no exception to this. 2019 is shaping up to be another monumental year for UCaaS adoption and advancements. It’s an exciting time, and fascinating to know that the digital trends embraced now will impact the workplace for years to come. Budgeting season is upon us and if you’re planning to replace your business phone system with UCaaS (unified communications as a service) in 2019, the time to start planning is now. Still undecided? Understanding the impact that UCaaS can have on your spending, productivity and revenue are key to making an informed decision. The first place to start when evaluating the best scenario for a future investment is to determine what your costs are currently. There are basic economics to apply when calculating the costs for your current system. These expenses will include any remaining lease payments or payoff values you have on your current hardware or phones, plus maintenance costs. Maintenance costs— should encompass any ad-hoc service calls made over the last 12 months and any replacement costs such as hardware, phones and inside wiring you’ve accumulated. To this amount, you’ll need to add the cost of your telecommunications services for your local, long distance, toll-free service, etc. If you do have a contact center in place, it’s best to separate the costs associated with that platform but to include it in the overall picture. Once you have a complete picture of your last 12-24 months of expenses, you can determine your annual and monthly spend for your current system and do a healthy cost comparison to a new one. Now for the good news. You no longer need to budget to purchase and maintain the “big iron” hardware phone system that you’ve had in the past. UCaaS is cloud-based—meaning you only need IP Phones and some peripheral hardware to support specialized functions. The only other consideration is whether you need/want to upgrade your network to support POE (Power over Ethernet) for POE-powered phones. As far as budgeting for the services themselves, most UCaaS providers offer multiple payment plan options for hardware and deployment so you aren’t paying huge up-front capital fees in the first year of the agreement. Phones, service and hardware can be rented or leased from a UCaaS provider with maintenance included, creating an operating expense (OPEX) vs. a capital expenditure (CAPEX). Many also offer the ability to purchase the phones if your primary objective is to reduce OPEX. You will want to make sure you ask about the replacement costs of devices over the course of the contract, and your ability to add and remove services based on growth or staff reductions. Lastly, don’t forget to factor in soft-costs and productivity gains that can lead to more revenue for your company. Unified communications and contact center services have many benefits that older systems don’t typically provide. Mobility – When employees can access their work communications systems from any device, there is a greater ability to service customers and communicate with other employees during times they would otherwise be out of touch. Teleworkers – When employees can take their work phone and voicemail home and gain access through a secure connection, softphones and other UC-enabled applications like video and web conferencing, allow work to continue even when the office is inaccessible. Phones – Replacing all your phones may not be necessary. Some providers allow you to bring your own devices or offer a mix of IP and analog devices on their system. There is also the option of just giving some employees softphones. Customer relationship management (CRM) – UCaaS offers advanced capabilities such as call routing, auto attendants and CRM integrations which can improve employee productivity, workflows and the customer experience. As you can see, crunching the hard numbers alone won’t get you to the bottom line budget. I recommend factoring in a conservative revenue gain component or the estimated reduction in hours employees lose with the current system that would be realized with a new unified communications system in place. Happy budgeting! How well could your business function with on-going performance issues or a major network outage? If the mere thought gives you anxiety, you’re not alone. Cloud-based applications (and their performance) have become essential in our ability to communicate internally and serve our customers. While there is no end to the benefits that cloud-based communications and collaboration offer, poor performance and downtime with these real-time applications is simply unacceptable. Due to the growing dependency on mission-critical cloud applications, we’re seeing more and more businesses opting to support unified communications as a service (UCaaS) with a software-defined wide-area network (SD-WAN) solution. These acronyms, if not already part of your vocabulary, will be soon, as they’re becoming more mainstream every day. 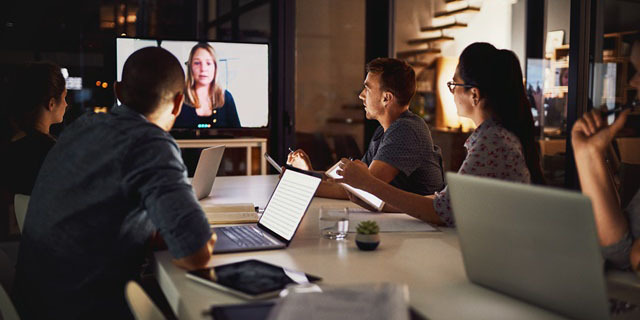 The powerful combination of UCaaS with SD-WAN allows businesses to aggregate multiple connections at their locations in an active-active configuration that optimizes network traffic to improve performance and guarantee uptime and redundancy for our coveted voice, video and collaboration applications. We call this “UCaaS at its best”. UCaaS applications have become the lifeline for businesses – and performing at their best – is certainly more critical than ever. Although highly beneficial, moving voice, chat and video conferencing and collaboration services to the cloud, can put increased strain on the network and cause performance issues. A consequence that can come with a hefty price – poor performance equals poor customer service, and poor customer service equates to customer loss. The bright side? Averting these scenarios is entirely possible with the addition of SD‑WAN. SD-WAN provides higher Quality of Service (QoS) for your communications, with more visibility into the overall health of your network, and more control to drill down to site, network connectivity, and end-user and application levels. For example, if your cloud applications are suffering because of an unusually slow network, you can actually see in real time that the slow-down is caused by employees streaming applications like Spotify, and just as easily, you can rate limit, or block Spotify traffic to ensure that UCaaS is a higher priority and has the bandwidth it needs. Unlike traditional WANs, SD-WAN is more cost-effective and delivers increased network agility. On their own, broadband and wireless access solutions are vulnerable to voice and video quality issues such as packet delay, jitter and packet loss. However, businesses today have the option of blending these access solutions in an active-active configuration to attain the right mix of cost, performance, reliability and bandwidth for UCaaS applications by leveraging SD-WAN. It’s no wonder that 25% of businesses are predicted to manage their WAN through software by 2019. September is National Preparedness month, and while many of us think about the steps we should be taking in our personal lives to prepare for disasters (and rightfully so), our businesses are not immune to the devastation that can ensue. A recent study by the Aberdeen group found that businesses lost upwards of $260,000 per hour during outages. However, this figure doesn’t just apply to outages from natural disasters. Disasters of any kind can have grave impacts on a business, which is why we encourage our customers to prepare for any type of situation. Whether you’re in the Florida Keys along the path of hurricane alley, or in Arizona where natural disasters are less likely, the reality Is, things happen. There’s a lot to consider when it comes to your business location, network and communications – all critical lifelines to your business. Below is a checklist that can help you prepare and ask the right questions of your service provider to ensure your business location, network and communications are ready in advance. Power – Do you have battery backups or generators? If so, routinely test them to make sure they maintain power. Ensure you have flashlights and batteries available just in case. Safety – Are first aid supplies fully stocked, and is safety equipment functional and easy to access? Awareness – Do you have an emergency plan for evacuations or other likely scenarios? If not, develop a plan and share it with employees. Make sure employees fully understand the procedures they will be expected to follow. More resources – Visit the EPA site for additional disaster preparation tips. Access redundancy – Do you have diverse connections to your location(s)? If not, how do you plan to ensure access redundancy? Network elements – Does your service provider have a geo‑redundant network? If not, how will this impact your business, should you find a way to ensure geo-redundancy? Failover capabilities – Are your network connections set up for failover? Or better yet, do they have SD-WAN with “active-active” connectivity? Mobile applications – Can your employees work effectively outside of the office? How can you ensure they can make and receive business calls, chats, texts and emails from any location or device? Call routing – Do you have a pre‑set plan to ensure calls can be answered in the event your location is unable to open? If not, develop a plan to re-route calls to other locations or mobile devices in an emergency. Change management – Can you make online changes to your communications system from anywhere that has public Internet? Cloud-based network – Is your communication system housed in your building or hosted in a secure data center? The above list is a good starting point. However, it’s always a good idea to contact your service provider to walk through a network and communications disaster recovery plan or find a service provider that can help you design a more resilient solution that will ensure your business remains up and running, no matter what. My favorite definition of productivity is “the effectiveness of effort”. In my humble opinion, volume of work doesn’t directly correlate with productivity. Instead, it should really be measured by the quality of output, the customer experience and the effectiveness of transactions. Coincidentally, when it comes to contact centers, many of the tools used to measure performance and productivity are heavily focused on volume of activity, metrics such as the number of customer interactions, the amount of time a rep is idle, how often an agent is available, missed calls, you get the gist. So, how do you shift the evaluation to more qualitative measures? Well, there are several ways to do just that using contact center tools available in the industry today. “This call is being recorded for quality assurance”. We’re all accustomed to hearing that when contacting a service provider for support. Universally, people act quite a bit differently when they are aware they’re being recorded, especially employees. Call recording provides a simple way to ensure your call center is performing at the highest level. With most cloud-based Contact Center as a Service (CCaaS) solutions, calls can be recorded automatically, and recordings can be accessed online for agents to listen to. Much like musicians that record and listen to a song multiple times before making the final cut, employees are often their own worst critics when hearing calls played back, resulting in the desire to improve their own performance. Contact center managers now have the ability to be front and center, fine‑tuning agent‑customer interactions. Supervisors can listen in on random calls without the agent or the customer’s knowledge. An even more instrumental capability, is something called the whisper feature, which allows managers to talk directly to agents privately during calls without the customer knowing a supervisor is even on the line. If things do get heated, the barge-in feature is clutch, allowing supervisors to enter two-way audio conversations to speak directly to both parties. When thinking about contact centers, most people think of big office buildings with open cubes and high noise levels. While this can provide a great environment to supervise and monitor physical activity, it’s not always optimal for productivity. Enabling the option for agents to work from home or other locations allows you to recruit the best talent across the globe and enable more time zones to be covered without the cost of remote offices. Many people today work more productively from home or locations where they can get into their “zone” and have a conversation with a customer without interruption. Finally, and something that is often overlooked, is the commitment to increase your agent’s awareness of their personal impact on the reputation and success of your business. Share your business plans and results from your CSAT (customer satisfaction) surveys with them. Get them involved more deeply in business reviews with large clients so they feel more integrated into the business and understand they are a key part of it. Engagement, paired with the right underlying technologies, can go a long way to increasing productivity and your bottom line. How many times have you called a service provider and been prompted to enter your account information, only to be asked again for the same information once you were routed to a live representative? Instead, what if the system recognized you based on the number you called from and you were greeted by a cheerful agent on the first ring who not only knew who you were, but why you were calling. Utopia, right? The technology needed to enable this type of intelligent interaction, linking customer data to communication networks, has actually existed for quite sometime. However, the challenge has been integrating the various application building blocks that enable it. In many cases, businesses tend to make application and system purchase decisions in silo, without considering how well those applications will work together, or, they think they’re in the clear by checking the box on integration during the buying process without a demonstration or test environment to verify it actually works. Additionally, customization of CRM and other software applications add to the complexity and make it difficult to integrate. While struggling with these challenges, how can you focus on delivering a great customer experience? First, define what you want the customer experience to be. For example, if you want to know more about your customer at each interaction, determine how they will be contacting you and what systems are involved. If you enable calls, email and SMS text, as an example, then there are at least three communication applications that require integration to your CRM software. Flip the paradigm, and you may also want your sales people to be positioned to provide visibility into customer information such as orders, notes and important details through integration with back-end systems. This level of functionality is important not only to your support and sales team, but to your entire organization. After mapping out the customer journey, identify the applications your employees need. Do your current applications meet the goals of delivering a great experience and integrate with other apps? If not, determine what is missing. A good checklist is to inventory all the tools associated with a customer contact. Determine where your customer data is inventoried and how that information is accessed in your current workflow. The list of vertical market-specific customer management CRMs and applications is quite expansive and most require some degree of customization, or at a minimum, a review for compatibility with your communications system. Finally, identify unified communications as a service (UCaaS) providers who have pre‑built integrations with your existing applications, or those that can build the integrations through an open Application Programming Interface (API). This will be vital to delivering the level of functionality your employees and customers will demand to make everything work together seamlessly. It’s important to look for providers that will enable easy integration to the apps you require. Be sure to ask for demonstrations so you understand exactly how they work in the real world, this is often overlooked. The bottom line is, integration of business applications should be a high priority for you and for any UC provider that you work with. The partners you enlist should be willing to work with your IT staff or third-party developers. Critical to ensuring a great customer experience, is having pre-built integrations, an open API for customization, and finally, a hands-on approach, to ensure everything will work together for you flawlessly. We’ve all heard it when calling into a business: ‘This call may be recorded for quality assurance.’ Whether you have sales or customer service representatives handling customer calls, the same holds true for any employee, how effectively they communicate is the difference between a happy customer vs. one who will be going elsewhere. Your reputation, and ultimately, your success, rely heavily upon your customer’s experience. Much like professional musicians, who listen to their own recordings to refine their skills and make adjustments to improve, modern companies strive to reach that higher level of professionalism and differentiate CX from competitors, and that’s where solutions like call recording come into play. Businesses today are not only concerned with the quality of communication taking place between employees and customers but, the growing number of threats and liabilities that their business is susceptible to on a daily basis. Here are five key reasons call recording is a must-have service for modern businesses. 1) Protect your company by reducing liabilities – The possibilities of lawsuits, unfortunately comes with the territory of being in business. We hear all too often how customer disputes can transpire from a simple miscommunication, and result in costly legal battles where it’s difficult to decipher who is at fault. Corporations, along with their employees can both be held liable in these circumstances, and no matter the outcome, the cost can be exorbitant. Fortunately, there are proactive measures that can be taken with services like call recording. By recording your calls, you create a record of every interaction. Recorded evidence can be extremely beneficial when trying to defuse customer disputes before they escalate into actual lawsuits. If the case were to go to trial, the recording would be a valuable asset for your legal team and could be admissible in court as evidence. 2) Satisfy regulatory requirements – There are so many different government regulations in place, it’s hard to keep up. Compliance is an important concern and requirement for many businesses, but especially crucial if you are in the financial, insurance, healthcare or legal sector. Many of these industries are required by law to record all verbal communications. Call recording ensures your business complies with these regulations and can prevent you from being fined or prosecuted. 3) Keep your business secure – Beyond satisfying regulatory concerns, there are also privacy and security concerns to take into consideration. With a call recording service in place, you have the ability to ensure that confidential business information is not compromised and can easily detect security problems. You can also monitor employee activity and help reduce any inappropriate conversations that could be detrimental to your business like illegal activity, sexual harassment, or the excessive use of company time for personal phone calls. Additionally, call recordings can be encrypted by some providers to make sure you meet compliance and CPNI requirements if relevant to your business or industry. 4) Maintain quality control and evaluate performance – Having the ability to listen to and monitor current and past call recordings provides a huge advantage, allowing for more control over the quality of the interactions your employees have with your customers. With call recording, recordings are stored in the cloud, making them accessible to listen to online from anywhere. This provides supervisors with instantaneous access and the ability to quickly and discretely evaluate how calls are handled in their natural context, and without employee knowledge. Additionally, this type of storage offers the ability to filter past recordings based upon a variety of search criteria including: inbound caller ID, outbound dialed number, extension recorded, date and time. When combined with robust evaluation report features, it doesn’t get any easier to customize reports and fill them out while you’re listening to recorded calls. 5) Improve training and develop best practices – We all have expectations of how we’d like customer calls to be handled and we do our best to communicate that to our new employees, but by having pre-recorded calls, you have the unique advantage of showing live examples of different circumstances that may arise and how you’d like them to be handled. This allows you to set expectations from the very beginning, as well as create uniformity and best practices for the employees to follow. Training and growth is a continual process and should be ongoing for employees no matter how long they have worked for you. With call recording, you can share employee’s recorded calls to address concerns on the spot and continuously improve the quality of your business’ communications. award-winning OfficeSuite UC® solution. Feel free to reach out with any questions.